Fans of the show MILLENNIUM will recognize Lucy Butler in the picture above, the show's most iconic villain to its hero Frank Black. Every time Lucy showed up in an episode I wore a wicked smile, knowing the tale would be dark, mysterious, and horrifying. As villains go she is one of my favorite of all time, the personification of true evil, played to dark perfection by Sarah-Jane Redmond. Recently I entered a contest to write a Christmas story featuring Lucy Butler. The winning story would be read aloud, sometime around Christmas, by Sarah-Jane Redmond herself. There's another song that always stuck in my head in connection with Lucy Butler, but I shall post that along with the story. 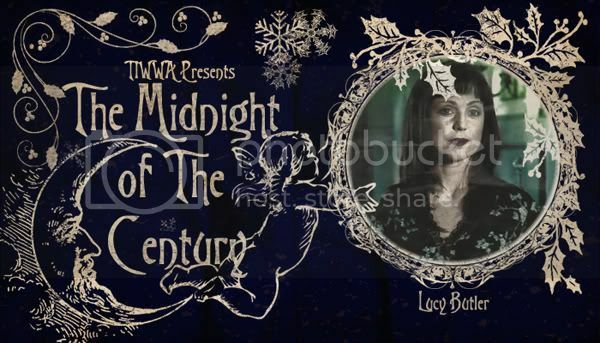 Best and Happy Midnight of the Century! A quick post tonight as I have many preparations still to make, not to mention washing up all the pumpkin blood after stuffing flaming candles in their hollowed out skulls. I have bowls of worms freezing to keep the swamp juice nice and cold for later. My windows are full of zombies as shall my television be most of the day, all leading up to the much anticipated premiere of THE WALKING DEAD. ...and also for carving dinner. Have a Happy Halloween, get scared and be scary! 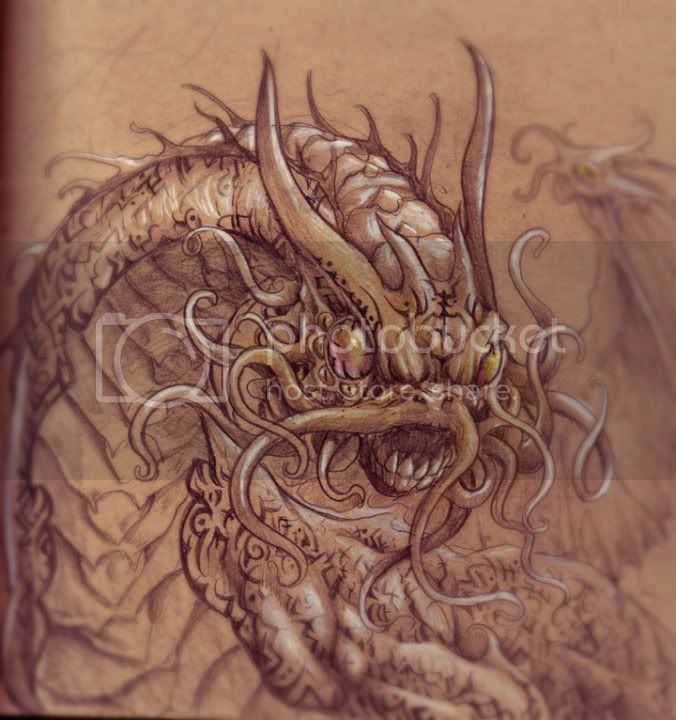 Many moons ago, in the early days of the Forgotten Realms ongoing author interviews on the WotC Novel Group, there was once a call for monsters...new monsters, beasts no one had ever seen before, existing only in the minds of your favorite writers. Well if this weekend, this Halloween weekend, isn't the right time for a monster then I don't know what is. I had fun with this little project, first visiting one of my favorite places in D&D, then tackling the monster type that I first wrote about in the Realms. And here's the full sketch that I did. And here is the far superior drawing that my good friend Jeff Welborn put together based on the idea. 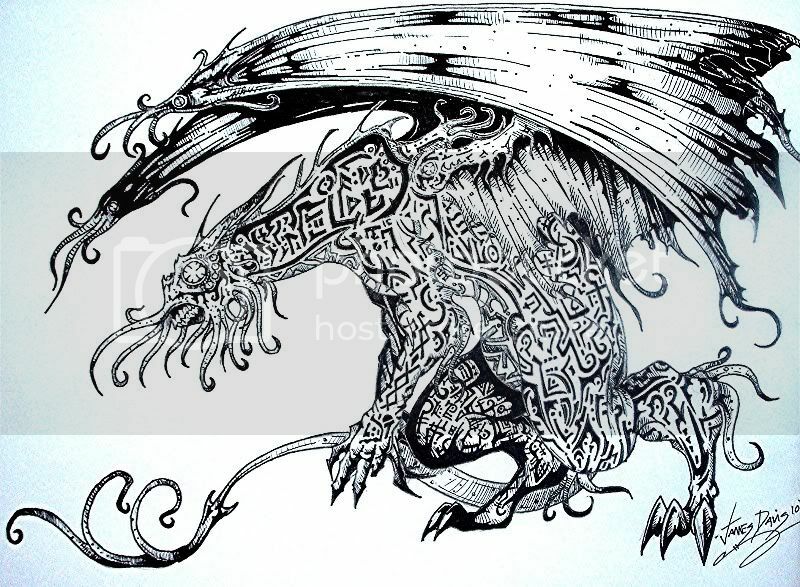 Also, upon examining the idea further, I have to conclude that this would be a species born in the Far Realm, but that eventually escaped, maintaining the general shape of a dragon if having nothing biologically in common with other dragons. I would imagine that any creature brought into the Far Realm for breeding that did not escape would become, in time, an unrecognizable nightmare so far removed from its origins as to be an entirely different creature. In other words, being an unrecognizable nightmare, far more fun to write about in my horrific opinion. So, enjoy! Give it stats, sic it on your favorite characters, or take the basic idea and run with it, this holiday can always use another monster. Tomorrow I'll post some more Halloween fun. Happy Halloween to all and Season's Beatings! --H.P. Lovecraft "Supernatural Horror in Literature"
Have had little to blog about recently, busy dealing with house-work, battling swarms of evil insects, digging deep into my horrific little heart to write and write and write some more. Still working on the first draft, staying ahead of schedule so far, and pouring everything into it. Most importantly, working at my own pace. I haven’t done a painting in a long time, but I can’t help writing in a style similar to how I paint. Seemingly finished details would disappear as the composition of other parts of the work started to take over, so I had to go back, illuminate or change to make things match, to keep the overall picture in balance. Speaking of creepy, plenty of research, inspiration, and fun recently and forthcoming for we horror fans. I’m currently reading Guillermo Del Toro and Chuck Hogan’s THE FALL, the second book in their Strain Trilogy (I got an advanced copy at work). So far it is great, perfect. I know a lot of people enjoyed THE PASSAGE, but Del Toro’s trilogy has all the ‘fun’ stuff that THE PASSAGE used a hundred years to skip over. Plus the vampires are just cooler IMHO. Also looking forward to the AMC series based on the comic-book THE WALKING DEAD, debuting in October. Until then I’m already starting my steady stream of horror movies, books, and music to carry me through to Halloween. I hope to knock out a huge chunk of writing during my favorite season and if all goes as planned I’ll start second draft edits in late winter, maybe have something ready to start shopping around near the end of spring. 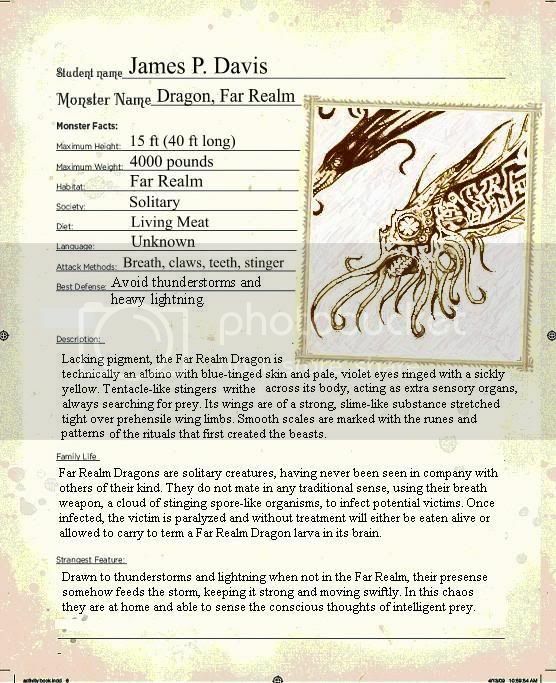 Also working on some Lovecraft inspired scripts, a few short-stories, and starting a brand new D&D campaign on the 21st, w00t! Much as I loved the epic ending to our last campaign—a final battle that will live on in tales and song for as long as the Late Knights (our unofficial group name) gather—I look forward to meeting the new first level characters, the return of some old friends to the table, breaking out a new DM screen, and grinning maliciously every time I roll a nat 20, mwahaha...actually, according to my players I tend to wince before smiling, they hate that, heh. What about the other DMs out there, have any particular ‘tell’ when you roll a twenty (or any nasty result) on a player? …Happy Birthday H.P. Lovecraft (August 20, 1890- March 15, 1937), a little early I know, but that’s how I roll. --H.P. Lovecraft "The Picture in the House"
Okay, another long, busy, occasionally torturous month…another blog-post. A few cool new things, first up: E-books! I had also planned on making a new book trailer (with real special effects this time! ), but with the death of my old computer also came the loss of the Windows XP Movie Maker program I was using and though I love Windows 7, this new Movie program just doesn’t measure up, not even close. All the same, many thanks to the Powers-That-Be at WotC for the legal assistance and Nox Arcana for the permission to use their awesome music. In response to a question on my previous post, I am not currently working on a Forgotten Realms novel, which, after the last three years, is an odd feeling since the last three books have been written right on the heels of one another. On one I was actually finishing up second draft edits as the contract for the next book was arriving in the mail, lol. Though I am completely open and totally ready for another dive into the Realms, a nice little breather this time is not unappreciated. The horror novel I’m currently writing is moving along at a steady and self-appointed speed, giving me plenty of time for consideration of each chapter before steamrolling into the next. My monsters, based on some obscure bits of Greek mythology, are constantly evolving in my imagination, so it’s good to have a loose personal deadline. Met Elvira. Awesome. Got her autograph and took a pic with her (picture of Elvira and I on a friend's camera, coming soon). We all decided she is immortal and will never die. There was much speculation upon how she accomplished this, top theories including: bathing in the blood of virgins, eating babies, and the quickening. But Megan got the better picture I think. That night we went to eat at the hotel restaurant, last minute decision. It was mostly empty, our table and one other at the interior tables. 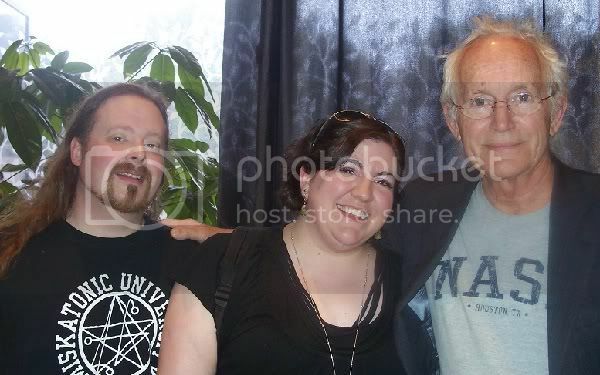 At that table sat, Lance Henriksen. Then, a couple at a time, the entire cast of CHRISTINE filed in, having their reunion dinner just a couple of tables away. Julian Sands (WARLOCK, ROSE RED, ARACHNOPHOBIA, etc.) wandered around nearby, chatting on his cell-phone. Meg Foster (THEY LIVE, BLIND FURY, etc.) 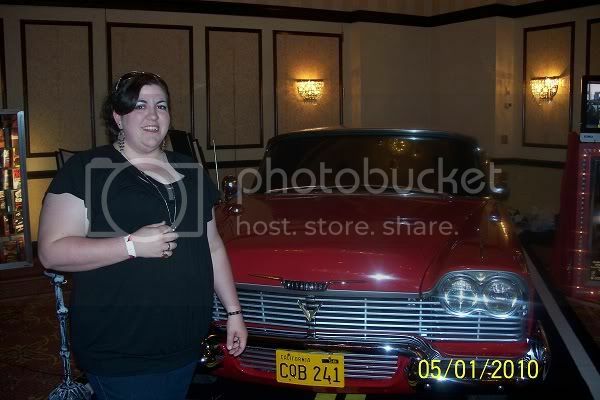 skipped in singing 'Stayin' Alive' to join the CHRISTINE crew. Derek Mears (Jason Voorhees in the new FRIDAY the 13th...and the nicest giant person you could ever hope to meet) sat nearby as well. My friends and I very discreetly gawked and nodded knowingly at one another...our last minute dinner decision was an awesome idea. The last part of Day One was the showing of a low-budget horror film...I hesitate to say the title, for I certainly expected cheesy and bad (I often thrive on such movies), but to even give this one a bad review would give it credit for deserving a review at all and place it within a category of real movies that get reviewed. I can't do it. It was, sadly, the only downside of Day One. I only mention it because of how awesome a day we had, even a movie, no, film? No. Even a series of recorded images played in sequence this bad couldn't ruin the time we had. To be honest, Day One dominated the weekend. Will definitely return next year. As for now, my horror batteries properly charged (not that they ever really die), writing continues as always. I'm aiming to be done by Halloween...we'll see how close I make it. …and of wizards, mysterious pasts, justice, the dead, dragons, and skulls and angels and devils and, well, you get the picture. There’s a lot, it’s a city and there’s a lot of stories. I’ve always loved Waterdeep, either as a jumping off point for a game or as a setting for a complete campaign. And much as I loved all that was familiar in the city, what I loved even more was carving out little spaces for myself, a tavern here, a secret dungeon entrance there, tracking down the dark, shadowed spots where I could open up new stories…Never did I think, nearly twenty years since I started playing D&D, that I would have a chance to make some of my little ideas a real part of Waterdeep and have them published alongside several other wonderful stories about Waterdeep. And yet here is the book, in my house. My wife, my best friend, and my mother-in-law have already started reading it…and all of them racing toward one particular chapter that, while I’m proud to have written it, may make them …well, no spoilers here. I’ll just say the novel was masterfully edited (thanks Susan!) and uncensored. Of course, I tend to be a bit darker at times (shock). And I’ll say also a big THANK YOU to Ed Greenwood for his awesome introduction in the book. Was quite speechless when I first read it and I still feel that just saying ‘Thanks!’ doesn’t quite cover it. I’m glad he enjoyed and I hope everyone else does too. 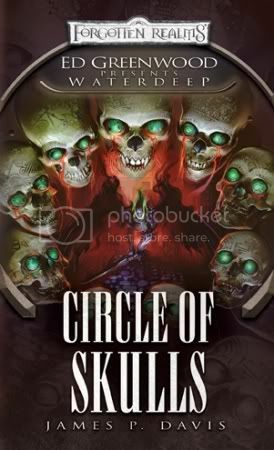 Circle of Skulls should be hitting shelves next week and I hope everyone gives it a shot along with all of the Waterdeep novels if they haven’t started them already. I was going to give a rundown of the entire series, but I think Mr. Greenwood has already done a good job of it in this video interview. And for my next feat…now that I’m back on a real computer with a nice big normal keyboard (whoohoo!) I’m taking my ton of notes and tackling some real-world horror (finally!). I still hope to write more for Forgotten Realms, but during the break I gotta’ keep the story-demons in my head appeased and they are pushing to get this little tale out into the world. 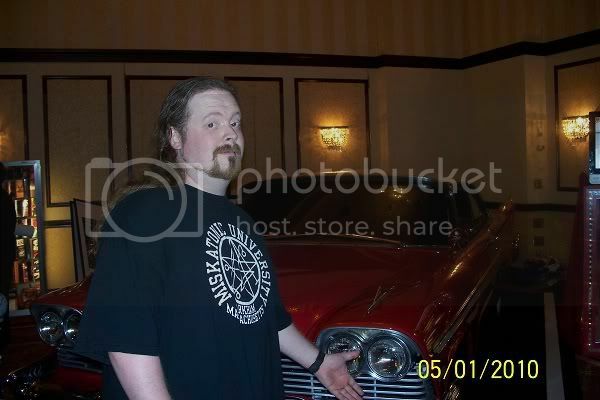 So, after taking in an extra dose of horror at the Texas Frightmare Weekend horror convention (again, whoohoo! ), writing resumes in overdrive and the playlist has Iron Maiden’s Number of the Beast on repeat. Been almost a month since my last post, an eventful month and not always good events. Car trouble, major computer trouble, minor sickness, household appliances refusing to obey my commands...you know, the usual junk. I'm using my wife's laptop and her tiny keyboard full of typos. Just feel out of sorts on this thing, like I'm sleeping on a friend's couch while my house is being remodeled or something. Laptops are useful, but a full desktop is my comfort zone. So, luckily, my latest writing project is complete and in the hands of my editor and I'm taking a wee break before tackling the big project that I have planned next. Also lucky, I've felt very 'in the zone' writing-wise, I just need a full screen and a bigger keyboard to keep that going. Until then I'll stick to my favorite pens and graph paper notes to hang on to the momentum. Also doing some new character sketches, but drawing lately has been a crap-shoot....or a box of chocolates...or something totally up to chance, or choose your favorite metaphor for an uncertain future event and run with it. I churned out one decent bit of artwork (on display sometime this month maybe? Links will be provided.) and then the talent went on vacation, it's a skill I rarely work out, maybe that explains why the writing feels more solid. On that note, you can watch for updates on all Wizards of the Coast novels, and find some great posts by authors and editors with excellent writing and publishing advice, at the Wizards of the Coast novels book club. Found right here: http://community.wizards.com/bookclub. Every Monday the Forgotten Realms authors have fun with random questions posed by editor Susan Morris and bookclub members. And everyday there is something new, on writing, publishing, new releases, signing events, book recommendations, etc. Or don't, no big. While I can only guess what the bloodgutter might be when spoken of in that context, I'm sure it's somewhere just outside the realm of what may be called 'normal' and is likely a perfectly legitimate way to spend one's time so long as nobody gets hurt. The latest round of answers over at WotC Community revolves around the subject of A+ papers, or if not A+ then at least our favorite papers. My answer reminded me of all that time in the library researching stuff I would have normally been reading about anyway. Swords, axes, the evolution of armor, the dominance of the longbow. That was my favorite and last year of high school in my favorite class, English, with the coolest teacher I ever had, Mr. Shanks (without whom my transition from comic-book artist wannabe to author might have taken a bit longer). I'm especially reminded of the paper because Mr. Shanks enjoyed reading the trivia regarding the 'bloodgutter' (or the fuller), a narrow groove down the length of a blade, usually on both sides. He enjoyed the bloody parts of the stories and books we read for class, so we had quite a bit in common. Until then he had assumed the bloodgutter was just that, to allow blood to run down the blade or to allow bleeding around the edges of the blade while still embedded in a victim. In truth the former is a bit silly and the latter a bit impractical, i.e. how long might one have to wait, in the middle of a battle, for someone to bleed to death? Hope ya' brought two swords...or a Snickers bar, you're not going anywhere for awhile. Anyway, the groove was cut simply to lighten the blade (usually by up to 3 or 5 pounds, depending on the length) and to stiffen the edges, making the blade stronger. Pretty basic, practical stuff, but it was one of the details cited by Mr. Shanks as 'very cool'. For me, hearing a teacher say 'cool' or 'awesome' in a genuine, not 'trying to relate to you youngsters' kind of way was one of my favorite things. I had few teachers involved enough to talk like that (and never a math teacher...well, maybe one, but he thought math was cool...freak). Well, I feel as though I'm on the edge of a wandering ramble and must end this before it takes a weird sidepath and concludes with theories on quantum mechanics and questions like, "Why can't it be Schrodingers's Dog? Or, more intriguingly, was the cat really a dog all along?" Man, don't get me started...So, Author Roundtable: go read it! Cool Teachers are, invariably, cool. And a bloodgutter is no place for your mind, for if ever the two should meet one can be assured of having a very bad day that will probably last for the rest of your life. Being creeped out is not my usual state, in fact, should there be anything fitting the description of creepy in my vicinity one will find me moving steadily in its direction to get a better look. Honestly, I would be the most boring ghosthunter in television history with my own show, walking into the dark, eager to stand face to face with the ghost that I just found out was a dumb ol' shadow. But occasionally I'll see a movie or read a book that sticks in my head, a few examples are here http://tiny.cc/LnbV6 in the latest Author Roundtable with the Forgotten Realms writin' crew. Mostly though, when watching a movie or reading a book, when something really creepy happens and my wife covers her eyes...I cheer. When the little kid in The Ring freaks out because his mom helped Samara and you find out she's not dead yet, I cheered, gleefully. When Michael Myers gets up after you're certain he's dead. Me, cheering. When the explorers in King Kong end up in the giant bug caves, the music stops and all you hear are the echoing sounds of crawling legs, men screaming, and mandibles clicking, there's me, edge of my seat, grinning like a goon just drinking it all in. Same as in Paranormal Activity and in every good horror movie or book I've ever seen or read. 7-- Mindflayer: representin' the Lovecraftian crowd are my favorite cephalopod-faced beasties. Eating brains, talking in your head, and keeping goblinoids as pets (and snacks). Decent base creature for any spell casting class, therefore making them extra-scary brain-melting fireball-slingers. Super-fun for the evil DM. 6-- Dracolich: Need I explain? It's a skeletal dragon! With spells! It's one of the most heavy-metal monsters in the game and it rawks. 5-- Death Knight: And perhaps you might need a heavy-metal warrior to complement your heavy-metal dracolich? Done. A lich-like template for the warrior classes, made ever so much more cool by Lord Soth of Dragonlance and Ravenloft fame. ...being a bloodthirsty DM makes me feel all warm inside. ...or Captain Oblivious? You decide. Personally, pooling all of our talents together I see a traveling road-show of some sort. We have a decent bar, a juggling act, a sharpshooter, pie-stand, navigation, etc. As for a show, well, I doubt we'll have much trouble putting together a decent story. Acting on the other hand...who knows? One way or another, it'll be entertaining. Been a bit of a while and I've been meaning to post more for some time, so I figure New Year's Eve is as good a time as any to jump on and say goodbye to 2009. 'Twas a strange year with more downs than ups and I shall not be sad to see it well behind me. Ready for a fresh start. I'll certainly update with news and whatnot as I usually do, hopefully more frequent than I have recently. I've been focusing less on the internet lately and paying more attention to the world (the 'outernet', if you will). Buckling down on my writing, tackling the projects I always said I'd get around to one day, trying to make sure all my 'one days' are in the here and now. I might even dabble in movie-making soon, well, writing the script and consulting anyway. So, prospects for 2010 looking good. I have started my resolutions two months early, eating better, working out (15 pounds gone bye-bye! ), getting out of the house (and the state), camping, cutting my smoking in half, etc. I figure that way it'll seem more impressive if I'm actually following through on my resolutions by the end of January, heh! For now, I have a party to look forward to, less to ring out 2009 than to welcome in 2010. I will be silly, possibly loud, likely a bit inebriated, and among many friends. When I recover, sometime in the late afternoon of January 1st, I'll clean up the house and sit down to start writing. I've had a bad dream swirling around in my head for more than a decade and it's about time I put it down on paper...or rather on the computer screen, using a ton of notes on paper, so I guess it's already on paper, just as a super-rough draft. Anyway, everyone have a safe and happy new year! Ah, tis time, tis time...the house is covered in webbing and a creepy orange glow and I have fresh pumpkin guts in a plastic bag. I shall display their hollowed out bodies with appropriate candle lighting this evening. The TV shall display naught but horror movies, history channel halloween themed shows, and if need be, news reports warning us all of the zombies running loose in the streets. And it looks as though, if the weather forecast be correct, that we shall finally, after several years of hoping, have a cold Halloween night (whoo-hoo!). And full, free movies at Hulu! ...and many more, these just caught my interest first.